French Toast Avignon - Do You Know The Muffin Man? Notes: This tiny book, published in 1992, has a lot of ideas for a full breakfast spread, taking inspiration from morning traditions from around the world. 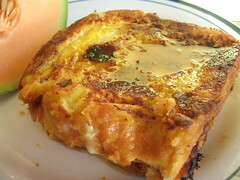 The French toast recipe comes from the section on Provence. I didn't use the extra egg whites, and used raisin challah instead of French/sourdough bread. The thick slices held up well against an overnight soak in the orange-drenched mixture (fresh orange juice, orange zest, plus Grand Marnier). It's slightly tangy, with pronounced citrus flavour. Yum!